Now that the fourth Quarter of 2017 is finished, here’s a look back at Q4 and comparing it to last quarter and a year ago. 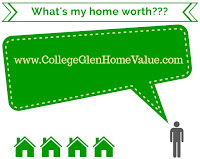 This is only for College-Glen (College Greens & Glenbrook) single family homes. Q4 started HOT coming out of the fall season as most homes were selling at or above list price within a few days. Lots of buyers and lots of homes getting sold. Very similar to the last two years around this time. As the winter approached and the fourth quarter came to a close, the market slowed down to a #PriceSensitiveSellersMarket. Still going strong but some homes that were over priced started to sit a bit. Still offers but 2 or 3 instead of a dozen. As we enter Q1 of the new year, the sellers that will have success need to have the combination of priced right/show well/good marketing. That is the formula for success as a seller during the slightly slower winter months.